It’s not an infrequent occurrence to hear someone describe soccer as their life. For many that I know — myself included — that’s a fairly accurate statement. I run a soccer website and spend a majority of my free time watching and taking in the beautiful game. My sister and her husband are both college soccer coaches. A fair few of my friends make their livings training and working for youth clubs. And a privileged few of my acquaintances actually pay their bills by playing the beautiful game. But it’s a rarity that you ever hear someone talk about how soccer has saved their life. Unless, that is, your name is Lawrence Cann. Lawrence Cann is president and founder of Street Soccer USA, a non-profit that aims to “improve health, education, and employment outcomes for the most disadvantaged Americans by using sports”. Working most frequently with homeless youth and adults, the program currently operates soccer-based programs in sixteen cities around the country. Probably best known for the team they send to the annual Homeless World Cup, SSUSA’s biggest project every year is actually the domestic Street Soccer USA Cup. At that, all sixteen cities in the program send a representative squad of program participants to take part in a national tournament. 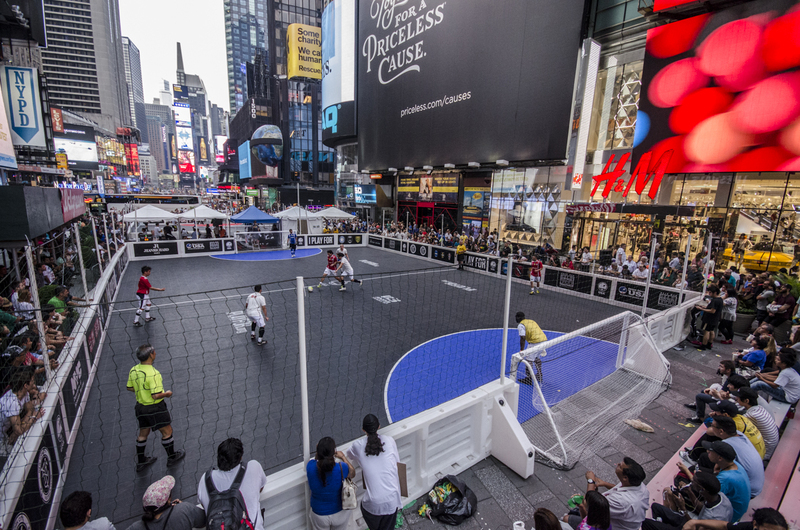 And as it just so happens, the 2014 edition of the Street Soccer USA Cup kicks off this weekend in San Francisco. So to help get a better understanding of everything that the SSUSA program and their annual big event does to help the disadvantaged across the country, I spoke with the Lawrence Cann to get the low down on how they’ve managed to use soccer as a vehicle for social change. DJ @ WSOTP: Before we dive too deep into talking about Street Soccer USA, I wanted to talk a little bit about a bit of your college experience. I looked long and hard at attending and playing for Davidson College, your alma mater. But I eventually opted to study and play elsewhere. So tell me, was the free laundry service that Davidson offers really the best part about going to Davidson? Lawrence Cann: It does sound kind of exciting, but they’re not necessarily the best launderers out there! I think I used the laundry service once or twice, maybe for my underwear or sheets or something of the like. But any of my nice shirts I tried to keep clear of the giant boiling pots of water that they use to launder. The funny thing is, I still use my laundry number from Davidson as my ATM pin, as it’s one of the few random numbers I can always remember. DJ @ WSOTP: Well, I’m glad to hear I didn’t use that to make my decision! Alright, so let’s move on to the soccer side of things. So both you and your brother Rob — the current COO of Street Soccer USA — are former Division I players. Did either of you envision your lives continuing to revolve around soccer after you finished your college careers? Lawrence Cann: Not at all! I seriously considered continuing to play after college and had that opportunity. But I made the decision to transition all of the energy and hours of the day that I had devoted to soccer to other endeavors. I was really cautious about that, and tried to get as far away from soccer as possible. And this really all came out of nowhere. DJ @ WSOTP: So how do you two go from being college soccer players to running Street Soccer USA? I was already struggling myself with the question of how I could get involved in these people’s lives, and then just walk away at the end of the summer. So I decided to stay, and developed a program called Community Works, which has the same premise as Street Soccer. And typically in homeless services, you build relationships in the course of delivering the service. Our model was to build authentic relationships first through common experience. Especially with the number 18-24 year olds that were homeless, sports just seemed like a natural way to do that. I loved soccer even though I wasn’t doing it and still had a passion for it — and though we tried basketball a little bit — so we tried it. And it worked, so we never really look back. Rob had just graduated college at the time, and I reached out to him because I knew he was really passionate about soccer, too. As it turned out, he was really good at working with folks, too. And together, through our different strengths and soccer, we’re able to provide a caring environment and absorb a lot of the trauma and the anger, the outbursts and frustrations, by giving them unconditional support. DJ @ WSOTP: Soccer isn’t the only part of the equation when it comes to helping homeless players. In what other ways do you aim to help participants get back on their feet? Lawrence Cann: There’s this model where you can use sport as “the hook” to get people involved in what you’re doing, and then you connect them to services. One thing that sets us apart a little bit is that we design into the soccer practices a curriculum that communicates and transfers life and job skills that our folks need. They typically grow up in homelessness themselves, without a lot of family structure, and bounce from school to school. We ask them who the mentors are in their life, and most of them can’t even answer that question. They lack a lot of those things that many of us take for granted: how to ask for help, how to look someone in the eye, how to deal with frustrations. So we look at our program as a social service program, and not just a sport program. Of course when you play soccer with someone, your relationship changes from being a social worker-to-client, but coach-to-player or player-to-player. And that relationship changes, it enables us to make these service linkages. What we do varies a lot of from city to city. For example, here in New York, a lot of folks have immigration issues. So we link them with pro bono immigration attorneys so they can get the answers they need to make the right decisions about applying for asylum or a visa or getting a green card. Other times we connect them to job training programs, treatment programs, help them to get a GED. Everyone on a team is required to set three, six and twelve month goals. One of our really early insights was that many of these people are really living day-to-day. And we found it could be very liberating for them to plan for a year ahead and think about where they want to be in a year. That’s the method by which we can make our service referrals and to recruit the resources we need to connect our players to. Ultimately it has to come from them — you know, to pursue and set their own goals — and then we try to give them the advice and the mentorship and linking to the services they need. DJ @ WSOTP: The first year you ever hosted a Street Soccer tournament was in Charlotte. How did that tournament go, and was there anything that you look back to as a kind of linchpin or critical moment for the development of your program? Lawrence Cann: There’s actually a funny story about that. Overall, I think we did a great job organizing our first tournament, and had arranged for all of these cool things. We had the street permits to march down from the homeless shelter to the fields, the county commissioner speaker, and the Chinese society had their Chinese dragon to jump out and join the parade. It was really well choreographed. But when we got down to the very opening kick, as I walked out there with the ball, I realized that I had never even thought to organize any officials for the entire tournament! So what we really learned from that first tournament was how important referees are. Referee recruitment has actually become a key part of our program, as we now have some of our players training to become officials. One of the cool things that came out of that was the development of what we call “Green Card”. We still have yellow and red cards, but we give the green cards to reward sportsmanship and fair play. The referees have really gotten into it too. And now it actually has a bearing on the results: if two teams are tied at the end of group play, our first tie-breaker are total number of green cards rewarded. Lawrence Cann: In all, we really knew we were on to something from day one. What happened was, people did come back with teams and found out they had learned a lot. So we all reconvened and gathered our best practices, handed those over a group of academics that we had engaged and they went out and did another series of interviews. Through that qualitative research they did for us, that became the basis for curriculum that we developed. Prior to the first tournament that we had, we knew what we were doing was working. People were improving their lives, but we couldn’t tell if it was us or just because we had recruited in great partners. It turns out that it was a bit of both. 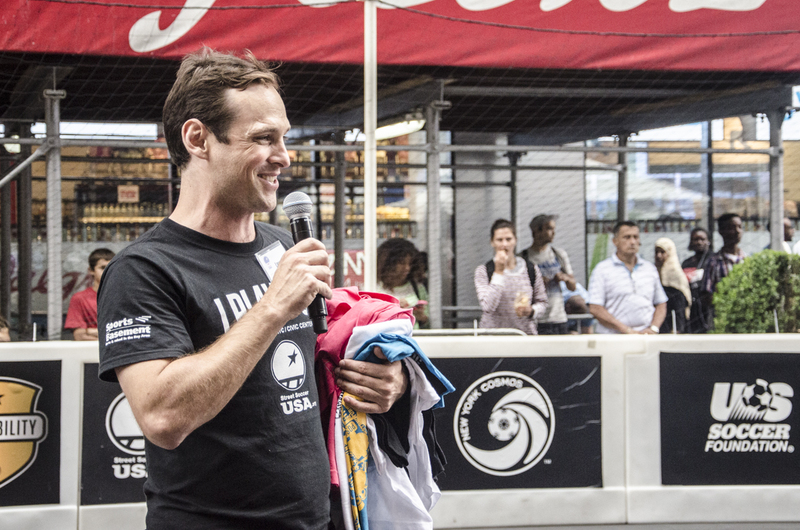 DJ @ WSOTP: How did you come to be involved with the Homeless World Cup? And it was kind of surprisingly easy. We called them up, applied — which didn’t involve very much aside from our names and where we worked — and raise some money and took a team. It’s become an amazing awareness tool for us because it’s attracted so much media attention. And that has made it easier for us to replicate and spread and build a wider footprint. Though while it’s been amazing, the Homeless World Cup is just one of the things that we do one week out of all of the other weeks of the year. That said, we’ve tried to turn it into leadership training for our participants. In the beginning, I think we took a team from a program that was just barely a year old. Now though, most of the folks who travel to the Homeless World Cup for at least a year and they go in what we hope will be the end of their journey. They’re people who have already made a lot of strides forward and try to use it to solidify the trajectory that they’re on. And a lot of those who have gone with us have ended up as either volunteers or have actually been hired by the Homeless World Cup as staff members. DJ @ WSOTP: So correct me if I’m wrong, but the team that you take to the Homeless World Cup isn’t necessarily the team that wins the Street Soccer USA National Championship. Is that right? Lawrence Cann: It’s never the team that wins. Winning the Street Soccer USA Cup is great, but we take a group of people every year that the coaches nominate that represent competency is three areas: 1) achievements off the field, 2) the ability on the field — because after all, this is a soccer tournament — and 3) is teamwork. It’s what we call having the ability to be an ambassador, because it means becoming a role model and example for others in the community. And we want to pick people who are able to handle that. DJ @ WSOTP: With such tremendous growth in exposure, participation and expansion, where do you hope to take the tournament from here? Lawrence Cann: We have a lot of goals in wanting to grow the program. The key thing we have to address — and like what we mentioned earlier with the research — is to look at the value that our program creates. The other thing we have to confront is sustainability. So far we’ve been able to build the event such that we don’t lose money, and in fact we’re able to raise some money that goes back into building the program. And as such, we’re trying to run the entire Street Soccer USA program as a social enterprise where we’ll develop city cups. We started with the national cup, last year we had our first west coast cup, and we’ll continue to develop further regional cups over the next year. These are tournaments where the centerpiece is always the program and a chance for our homeless participants for strive for and take part in. But the other side of it is Street Soccer — or four-a-side — in what we call the Open Cup, where anyone who loves soccer is able to sign up and play. And the fees that they pay for soccer will go to homeless youths and adults. By focusing New York and San Francisco right now, will eventually be able to create these cups in multiple cities where we’ll kind of have an NCAA tournament nationwide. We’ll narrow it down to one winner in all of the cities, and they’ll come together and play. The quality of play we’ve seen in the Open Cup in New York City was amazing, and the experience of playing those games on Times Square was mind-blowing. DJ @ WSOTP: Do you have any memories from over the years of running the program that really stick out in your memory? An amazing goal, moment or success story? Lawrence Cann: It’s been an incredibly rich experience for me, personally. Doing the work in, especially in the early years, working with people in crisis. It’s been a crucible for your own personality and soul. I feel like I’ve benefited as a human being since day one. We tell them this every year, but they really are an inspiration to me and everyone in our organization. So it’s really hard to pinpoint one moment because their have been so many great ones. One guy we worked with named Craig, and when he first came to us at 18 we were setting goals and I asked him, “Where do you think you’re going to be in a year?” And his response was, “Probably in jail.” But to see him now, after spending four years playing with us and working odd jobs, he’s gotten his welding certificate and is making good money that way. But every year when I come back to Charlotte we still play soccer. We used to have standing calls every few weeks, and the last time we spoke he told me how we helped him to become a man. There’s another girl we worked with that is a Somali refugee in our Minneapolis program who had learned English in like two years and was living with a cousin. When she turned 18, they kicked her out of the house and she had nowhere to go. Eventually she got involved in our team — she had always loved soccer but was never able to play back home — but she made our national team to go to the Homeless World Cup. However, Somalia wasn’t issuing passports because it was a dysfunctional state. So we worked so hard for so long to figure out her documents over an eight month process. When it came to apply for her visa for Brazil, it never came through, so I stayed back with her in New York and took her to visit places like the Empire State Building and see the sights even though she was missing out on the other experience. And she stayed so strong. We eventually sent her back to Minneapolis, where she finished her schooling. Now she’s coaching our women’s team there and is making $60,000 a year as a bus driver. She still comes back for our tournaments ever year. 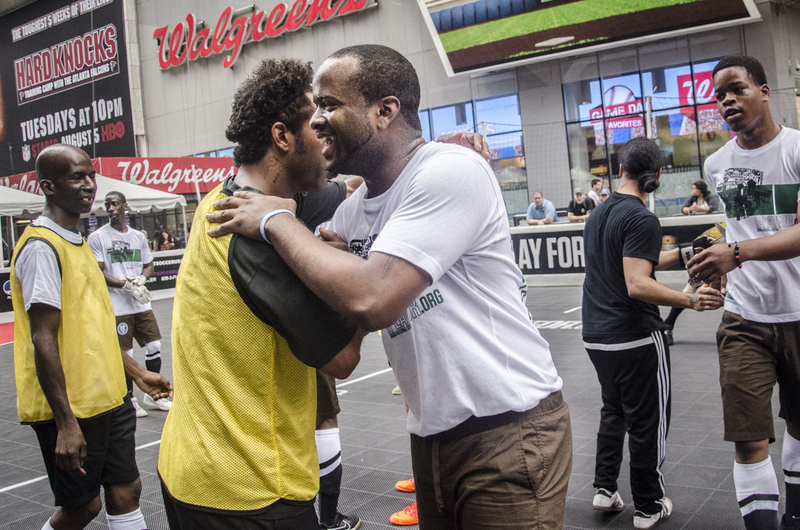 DJ @ WSOTP: From helping thousands of people land back on their feet, to getting to travel abroad, to meeting some pretty famous players, what’s been the best part of running an organization like Street Soccer USA? Lawrence Cann: It’s just lots of great stories like that. And that’s the one of the challenges for Rob and I — who end up doing most of the interviews and are the face of what we were doing — but it’s a team sport where a lot of these players who have become volunteers have made a big difference that don’t get the same attention. We’ve been able to create this awesome community though, and we’re really proud of that. All photos in this piece are courtesy of Street Soccer USA/Ye Ming. Thanks for sharing your thoughts on como ganhar dinheiro.